Quinoa has a great flavor and all kinds of nutritional benefits, sure, but that’s not why I love to cook with it. I love it because it cooks so quickly. Bring it to a boil, simmer 15 minutes, let it steam off the heat for a few more, and it’s ready to go to the table. Here the quinoa is dressed up a bit with a quick saute of scallions and corn that is ready to add to the pot by the time the quinoa’s 15-minute simmer is over, even if you start with whole ears of corn. Which you should definitely do in summertime. We often make this dish to serve as a warm or cold salad alongside a grilled summer dinner of fish and vegetables, but at this time of year using frozen sweet corn brings a bit of sunshine to the table. Pair this quinoa with Black Beans with Cilantro and Lime for a delicious meal, perhaps topped with a bit of salsa, sour cream, and a sprinkle of chopped cilantro. And once you taste this dish, you’ll probably find yourself making it often to serve as a side in place of bread or rice. 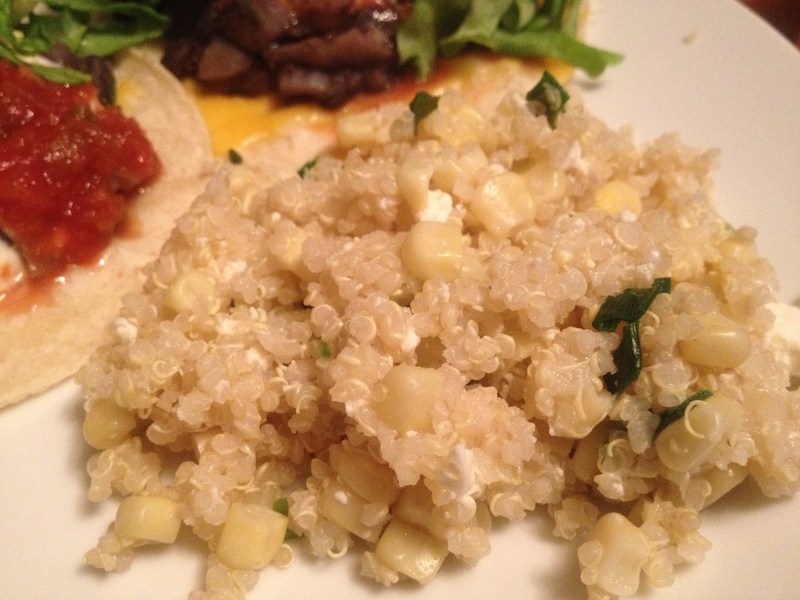 Quinoa with Corn, Green Onions, and Feta: In a medium pot, combine 1 1/2 c. quinoa with 3 c. water or stock, plus 3/4 tsp. salt if you are not using a salted stock. If you are using ears of fresh corn, cut the kernels off 4 or 5 cobs and set them aside, then use the back of your knife to scrape the cobs over the pot of quinoa, adding the milk and any last bits of corn from the cobs. (Save those corn cobs in the freezer for the next time you make homemade vegetable broth!) Bring quinoa to a boil, reduce heat, simmer 15 minutes, then turn off heat and let the pot stand for 5 more minutes. Meanwhile, melt a bit of butter in a frying pan and saute 2 c. frozen corn kernels (or the ones you cut from your cobs earlier) with a thinly-sliced bunch of green onions and a pinch of salt until corn is hot and the onions are bright green. Toss corn and green onions with the quinoa and a handful of crumbled feta cheese. This recipe is adapted from Deborah Madison’s Vegetarian Cooking for Everyone. This entry was posted in Easily Multiplies to Feed a Crowd and tagged cooking, dinner, DIY, family, food, homemade, kids, lifestyle, recipes, vegetarian, whole grain on March 12, 2012 by emmycooks. Oh man! Look at all this amazing food!!!!! Something is up with my wordpress “Read blogs” things and your posts aren’t showing up in the feed! I missed this and the balck beans, and the chocolate chip cookie bars, and the purple potato fritatta! Has this happened to you? In any case, will try to rectify this immediately. Great post on quinoa! It’s becoming one of my favorite go-to foods too! I’ve been on a quinoa craze lately, too, and will have to try it with corn. And if there’s a cookbook I use more often than Vegetarian Cooking for Everyone, I really don’t know what it is! Ok I am loving the ongoing quino craze online. It is the best! I do really like quinoa. I’m not into most of the “super food” crazes, but I am into quinoa’s flavor, texture, and protein! yep im all for quinoa as well – so versatile!! my favourite is when you combine with french green lentils, brown rice, pistachios, cranberries and cauliflower! I just clicked over to your site and not only does your quinoa salad look gorgeous (and with the lentils it could be a meal itself! ), but ALL those salads look great! Thank you for the link and the recipe. thanks! I’m working on my photos, the older ones aren’t the best but you get the idea!! I love bright and vibrant colours in salads! I love the way you eat. This is the kind of stuff I could live on all the time–salads, veggies, grains, yogurt, feta, etc. But I wind up cooking more meat and pastas and things because the gentleman around here eats so darn much. Your recipe selection feels so natural to me, but not expected–they’re each very interesting, there’s just a fluidity about them that I really like.